This section kicks off with an annotated English summary of Inga Hägg's description of the Trägerrock fragment found in the harbour at Haithabu/Hedeby. I am in favour of Thor Ewing's suggestion that this garment was called a smokkr, or in modern spelling a smock. 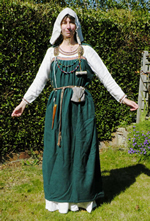 It seems a more elegant term than "apron dress", "tragerock" or "hangerock" and is a word whose modern use is consistent with its proposed dark-age meaning. Here is my own reconstruction of a Viking woman's outfit, including a reinterpretation of the evidence for the smokkr. This as it happens does not use the Hedeby fragment above but instead owes its origins to finds from Birka and Denmark. This is just one interpretation - there are many equally valid possible reconstructions. The name of my Viking character is Ingibjorg, and I wrote a short verse in scaldic style, just for fun, trying to express the views of a woman who has fled her home and is searching for a new life in England. She seeks a peaceful life, but knows the taking of land will be violent. I may have got carried away with the kennings...anyway, you can read Ingibjorg's Lament here. I am partway through making a reconstruction of an Anglo-Saxon woman's outfit, as might have been worn by a wealthy, religious widow in the late 9th century a.d. I have begun writing up my notes, and will add more detail as the outfit progresses. A few years ago I made a pair of trews in the style of the almost-complete pair found in Thorsbjerg bog. These probably date from around 400 to 500 a.d., and one theory is that they were a pair of late Roman cavalry breeks. Alternatively they may have been Migration Period, Germanic, in origin. There's evidence from Hedeby that the general construction method was in use in the tenth century a.d. and so I reckon they are a good pattern for the Viking re-enactor to use, being characteristically Northern European and first millenium a.d. They seem to me more appropriate than trousers based on jeans or karate trousers.